Dr. Ayya S.Ramdoss, founder of PMK Pattali Makkal Katchi campaigned for the central Chennai Candidate DR. S.R. Sam Paul at Gujji Naicken Street, New Avadi Road with Shri. NR Dhanapalan, Smt. 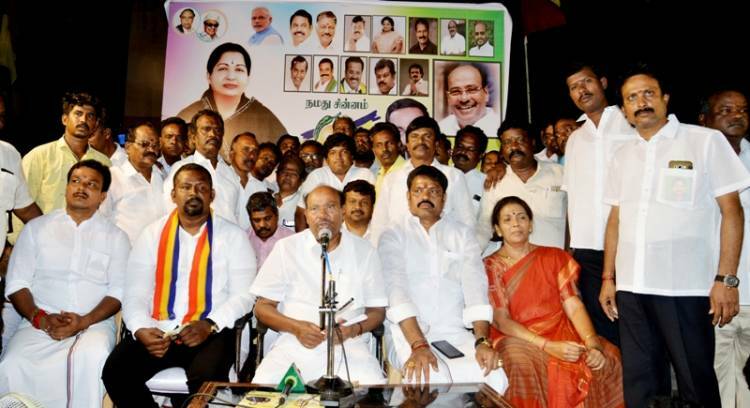 Gokula Indira, Shri JCD Prabhakaran, Shri T Nagar Sathya, Shri SR Vijayakumar, Shri N Balaganga and the other leaders of the alliance. At the Meeting Dr. Ayya S. Ramdoss , greeted the leaders of the ADMK alliance at the Venue. He said that as part of the Coalition, PMK was assigned the Central Chennai Constituency for which he himself chose DR. S.R. Sam Paul. He said he Chose Dr. Sam Paul for his flawless track records, his qualification, his commitment to help those in need and the love for his people. He further added that the constituency needed a young & an accessible leader who would stand strong for his people at the centre. Dr. Ayya S. Ramdoss then read out the letter from Dr. Sam Paul’s Mother to him ( letter attached with the mail) to the audience assuring that he has given the constituency to the right leader. He further shared a few excerpts of the time he spent with Dr. Sam Paul and his Family talking further about the value system & the responsible upbringing Dr S.R Sam Paul underwent to become the leader he is today. This is exactly what separate Dr. S. R. Sam Paul from the other candidates in the constituency. Dr. S.R. 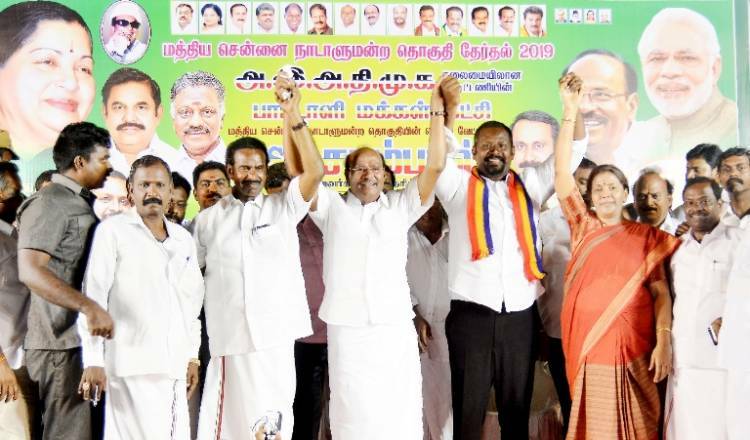 Sam Paul, is a man of the people, he is accessible to the people at all times whereas the opposition candidate Dayanidhi Maran who’s already been elected twice has hardly visited the people or the constituency. Dr. Ayya S. Radmoss , said he hoped for Dr. S.R. Sam Paul to win hands down, with a great margin of votes. With much confidence, he told the people that he will be back in Central Chennai in 6 months to celebrate the victory of Dr. Sam Paul. A ceremony by the people to celebrate Dr. S.R. Sam Paul. Dr. Ayya S. Ramdoss also added that out of all the constituencies he visited, none of the other candidates assured victory so confidently as Dr. Sam Paul. “Dr. S.R. Sam Paul, is hard working and confident in his success, he has already proven his efficiency through the success of his ventures and commitment to people through his efforts to help & support them at times of need. He truly deserves a chance to further serve the people of Chennai”, Said Dr. Ayya S. Ramdoss at the meeting at Gujji Naickken Street, New Avadi Road. “Dayanidhi Maran is involved in multiple scams, the party he represents is not for the welfare of the people. Its a corporate ran by Stalin, as its CEO and the other members the board of directors. They have divided the state among their families and their selected allies whereas the ADMK alliance is for the people. Lot of welfare schemes that actually benefits people has been brought in by the participating parties of this alliance,” DR. Ayya S. Ramdoss reminded the gathering. He drew his address to a close by requesting the gathering to extend their full support to Dr. S.R. Sam Paul, to vote for the Mango Symbol. He further called out for maximum votes & support for Dr. Sam Paul , so that the corrupt party & and its corrupt candidate may even loose his deposit.